The bulk of its revenue comes from building student accommodation. 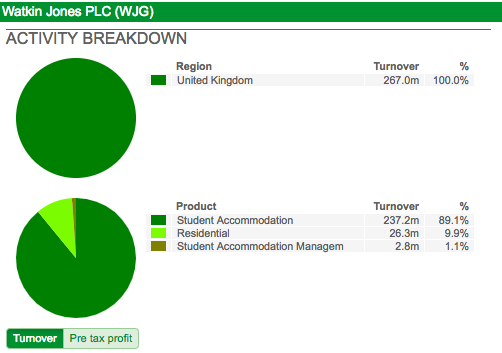 The breakdown of its 2016 turnover is shown in the SharePad chart below. Before we look at the business in more detail, let’s see how Watkins Jones stacks up on some key financial performance measures. 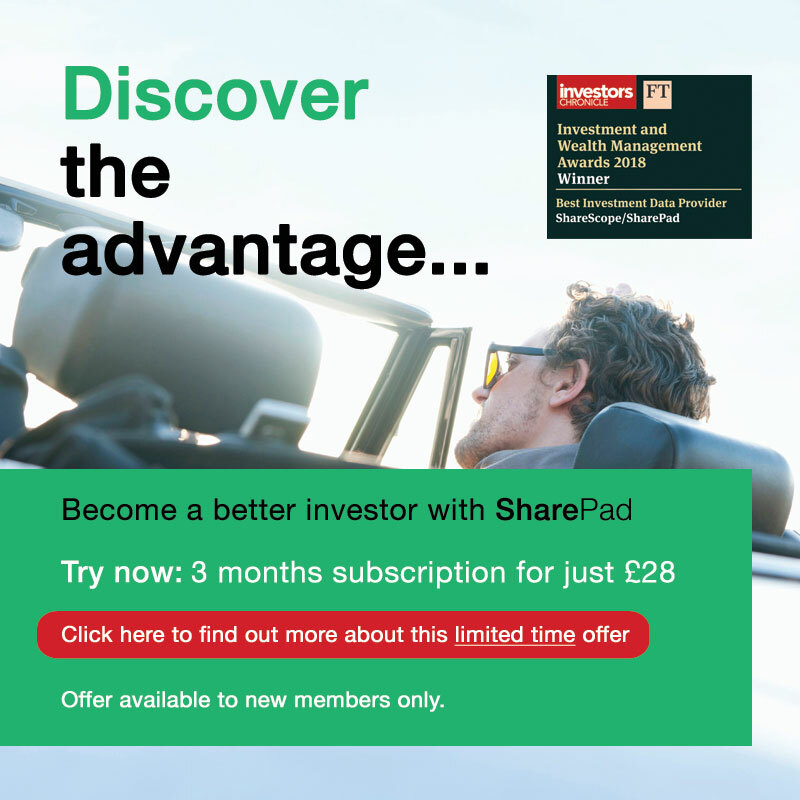 Bear in mind that the company’s admission document and SharePad only have financial data going back to 2013. It is possible to dig deeper into the company’s finances by downloading its historic company accounts from the Companies House website. 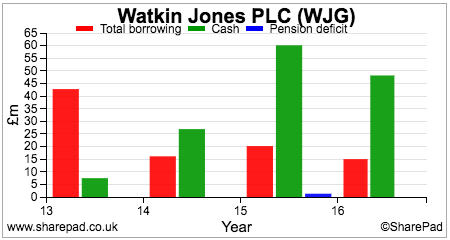 ROCE was at a good level in 2015 but fell back in 2016 due to trading profits (EBIT) being reduced significantly by a very generous pre-IPO pay package to management. 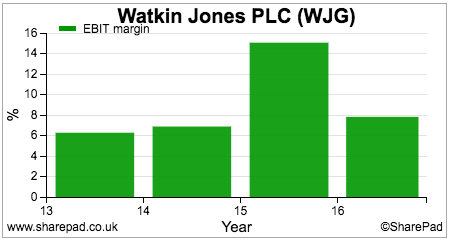 Profit margins were affected by the same management payout in 2016. Watkins Jones’ development activities are not as profitable as many housebuilders’. This is due to the relative lack of gearing to rising selling prices involved. Watkins Jones does get some uplift on the land that it buys when it gets it through the planning process but most of its profits come from the fixed priced construction of the developments. Housebuilders can make significant additional profit margins by selling homes on land in a rising housing market. Watkins Jones cannot benefit from this as much as it forward sells its developments to investors. This protects it from a falling property market though which makes it less risky than a housebuilder. 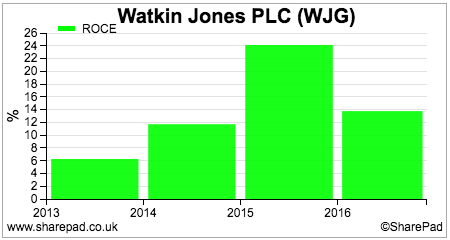 Forward selling development sites means that Watkins Jones tends to have a very attractive cash flow profile. With payments for land sold in advance and regular monthly payments to fund the construction, the company tends to convert most of its profits into free cash flow when the number of units being constructed is growing. This would not be the case if the development pipeline started to shrink in value as the reduced effect of forward selling developments would reduce free cash flows. The company has historically had some problems with debt. Back in 2013, Lloyds Bank asked the company to repay all its outstanding loans. This meant that the company did not have enough money to build out its development pipeline which caused profits to fall. Happily this is not an issue today as its banking arrangements are more settled and the company now has an improved ability to raise equity finance from shareholders due to its stock market listing. Although the company does have some debt, it has a larger cash balance to offset it giving it a comfortable financial position at the moment. PBSA is a growing market driven by demand for relatively stable and secure income streams from professional investors such as pension funds. The attractions of this market in recent years have been a growing stream of rental income (slightly more than the rate of inflation) and much higher yields than those available on government bonds. Rental yields have ranged from around 4.5% in prime London locations to around 6% in secondary regional locations. Around one third of the UK’s 1.7 million undergraduates live in PBSA rooms or beds. The bulk of these are accounted for by first year students in university halls of residence. Just over 250,000 are living in privately-owned PBSA. There has been significant growth in the amount of development of PBSA in recent years with 26,109 beds delivered to the market in 2016 compared with 15,527 in 2014. There is significant demand from foreign students with around a quarter of them living in PBSA compared with only around 5% of UK students. The number of students going to university is therefore the key driver of demand in this market. Student numbers and applications in the UK seem to be holding up well from both domestic and foreign sources at the moment. PBSA rents tend to be around 25% more expensive than rents for rooms in shared private houses. However, it does include utility bills and often other services such as broadband and contents insurance. The premium can also be justified by the higher quality and security of the accommodation. But will demand grow and can Watkins Jones continue to grow its profits from this market? The company believes that PBSA will continue to attract more students. The percentage of them using PBSA has grown from 4.5% to 6.4% from 2011 to 2016 and this could continue to nudge up given the quality of accommodation on offer. There is also pent up demand from replacing or refurbishing 75% of the accommodation on the market which was built before 1999 and lacks many of the amenities and quality of modern accommodation. Watkins Jones has been successful in growing its profits from this market in recent years and has continued to do so during the first half of its 2016/17 financial year. However, the number of beds in the pipeline for the next three years is currently expected to be lower than the number of beds delivered in 2016. How are profits going to grow? Profits growth will have to come from higher profit margins. This can come from a higher development uplift when sites pass through the planning process and/or higher construction margins from building more expensive developments. The trend in the company’s gross margins are encouragingly upwards but will have to continue this trajectory for meaningful profits growth to be achieved. Herein lies the problem facing Watkins Jones and its investors. Whilst the company has great visibility on its sales and profits for the next 2-3 years, it is under constant pressure to keep the pipeline of sites coming through. There is no significant source of recurring income to underpin a high and sustainable valuation for the company. It likes to have a pipeline of 20-30 sites on the go at the same time and has capacity to deliver around 10 sites per year. Yet if the values and margins of those sites do not increase then it is difficult to see how Watkins Jones can grow its profits. Increased competition is also a threat. This could come from residential builders looking to diversify their sources of profits to less risky income streams. Watkins Jones has been able to withstand competition by offering a completely integrated service to professional investors from initial site selection, planning, development and management. This is combined with a longstanding reputation for quality and reliability. Not many competitors – if any – can offer this. Will management profits become a significant value driver? Watkins Jones bought Fresh Student Living, a student lettings business in 2016. It receives a management fee for letting out the accommodation whilst the direct operating costs of the property stay with the owner. This business contributed £3m of revenues during the first half of 2016/17 with gross margins of 63.2%. It currently has 12,117 beds under management over 43 schemes which is expected to increase to 19,532 beds by 2020. The business can cope with 30,000 beds without increasing capacity. The company cites a typical rental income of £320 per bed per year in its latest results presentation. Assuming current gross margins can be maintained – meaning no operational gearing effects – then 30,000 beds would produce gross profits of around £6m per year compared with over £50m currently coming from the development business. This extra source of profits is welcome, but I do not see it as a significant value driver. The contracts are not evergreen and typically last 3-7 years. This highlights the risk that the contracts could be lost or re-tendered at a lower rate. Of course, they could be retained at a higher rate as well. Watkins Jones is all too aware of these potential problems. Therefore it is no surprise to see it targeting the build to rent (BTR) market where it can employ many of the same attributes of its student accommodation business model. The dream of buying a home of their own has become unachievable for many young people. This and the flexibility offered has pushed more and more people into the private rented sector. Billions of pounds have been pouring into the growing build to rent sector as professional investors seek to capitalise on this trend. These investors need companies to develop BTR properties and also manage them. This is an identical requirement provided by Watkins Jones in student accommodation. The company has six BTR schemes that are scheduled for delivery between 2019 and 2021. It believes that there are significant synergies available with its student business such as its supply chain and the management of its subcontractor network. Revenues from BTR could help offset any slowdown from the student market. However, it is likely that BTR revenues will not achieve the same gross margins as those currently being achieved in the student accommodation market (just over 22%). Telford Homes (AIM:TEF) is targeting gross margins of around 13% from its BTR projects in London. It remains to be seen whether Watkins Jones can do better. It does have a lettings management business called Five Nine to take an extra chunk of income out of the BTR sector. The business is small at the moment with 535 units under management across five schemes. If exceptional IPO costs of £26.5m are stripped out of 2016 results then City analysts are expecting an increase in underlying pre-tax profit from £39.8m to £42.6m. 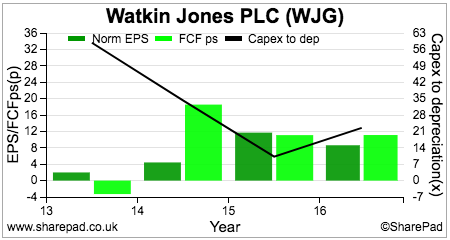 Growth is expected to continue for the next couple of years which should see some nice dividend increases as well. But do Watkins Jones shares offer good value to investors at the current share price? In my opinion, construction and development businesses should not attract high stock market valuations due to their cyclicality and lack of recurring income. However, I must admit that I like the fundamentals of the BTR and student accommodation development markets much better than those of UK housebuilding which are too reliant on subsidised mortgages for my liking. BTR and PBSA are less risky than housebuilding as the professional investor customers pay upfront for the land and give visibility on sales and earnings that housebuilders can only dream of. But having said that, visibility is no more than two or three years ahead. Some people might argue that increased earnings visibility for the likes of Watkins Jones might justify a premium valuation compared with a housebuilder. Maybe, maybe not. 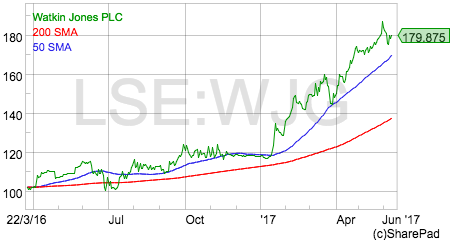 However, I think there are grounds for arguing that Watkins Jones shares have got a little ahead of themselves after a stellar 2017 so far. They currently trade on 13.3 times forecast earnings with a market capitalisation of £453m. Contrast this with Telford Homes which also sells mainly to investors and has a growing BTR business in London which could make up over half of its development pipeline in two to three years’ time. Its market capitalisation is £304m. It is forecast to make slightly more pre-tax profit than Watkins Jones this year but its shares can be purchased for just 8.6 times forecast earnings. It also has a superior short-term profits growth outlook to Watkins Jones as well whilst offering a higher dividend yield.